Old Sarum is the site of the earliest settlement of Salisbury in England. Located on a hill about 2 miles (3 km) north of modern Salisbury near the A345 road, the settlement appears in some of the earliest records in the country. It is an English Heritage property and is open to the public. Richard of Ilchester was a medieval English statesman and prelate. Herbert Poore or Poor (died 1217) was a medieval English clergyman who held the post of Bishop of Salisbury during the reigns of Richard I and John. The Bishop of Salisbury is the ordinary of the Church of England's Diocese of Salisbury in the Province of Canterbury. The diocese covers much of the counties of Wiltshire and Dorset. 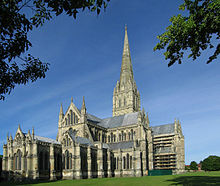 The see is in the City of Salisbury where the bishop's seat is located at the Cathedral Church of the Blessed Virgin Mary. The current bishop is Nick Holtam, the 78th Bishop of Salisbury, who was consecrated at St Paul's Cathedral on 22 July 2011 and enthroned in Salisbury Cathedral on 15 October 2011. Guala Bicchieri was an Italian diplomat, papal official and cardinal. He was the papal legate in England from 1216 to 1218, and took a prominent role in the politics of England during King John’s last years and Henry III’s early minority. Peter des Roches was bishop of Winchester in the reigns of King John of England and his son Henry III. He was not an Englishman, but rather a native of the Touraine, in north-central France. Sir Falkes de Breauté was an Anglo-Norman soldier who earned high office by loyally serving first King John and later King Henry III in the First Barons' War. He played a key role in the Battle of Lincoln Fair in 1217. He attempted to rival Hubert de Burgh, and as a result fell from power in 1224. His heraldic device was the griffin. Jocelin of Wells was a medieval Bishop of Bath. He was the brother of Hugh de Wells, who became Bishop of Lincoln. Jocelin became a canon of Wells Cathedral before 1200, and was elected bishop in 1206. During King John of England's dispute with Pope Innocent III, Jocelin at first remained with the king, but after the excommunication of John in late 1209, Jocelin went into exile. He returned to England in 1213, and was mentioned in Magna Carta in 1215. In 1220, while Poore was bishop of Salisbury, he ordered his clergy to instruct a few children so that the children might in turn teach the rest of the children in basic church doctrine and prayers. He also had the clergy preach every Sunday that children should not be left alone in a house with a fire or water. Also during his time in Salisbury, he promoted the education of boys by endowing some schoolmasters with benefices provided they did not charge for instruction. In 1237, Richard established a retirement house for the old and infirm clergy of the diocese of Durham. Richard was also an opponent of pluralism, the holding of more than one benefice at the same time. He not only held that a clerk receiving a new benefice should give up the old one, but that if the clerk protested about the loss, he should lose both benefices. He also decreed that the clergy should not be involved in "worldly business". Poore House at Bishop Wordsworth's School, Salisbury is named in honour of his legacy to Salisbury schools. Poore died on 15 April 1237  at the manor of Tarrant Keyneston in Dorset. His tomb was claimed for both Durham and Salisbury, but most likely he was buried in the church at Tarrant Keyneston which was what he had wished. He is commemorated with a statue in niche 170 on the west front of Salisbury Cathedral. ↑ British History Online Bishops of Salisbury. Retrieved 30 October 2007. 1 2 British History Online Deans of Salisbury. Retrieved 30 October 2007. ↑ British History Online Bishops of Winchester. Retrieved 2 November 2007. ↑ British History Online Bishops of Chichester. Retrieved 20 October 2007. Walter de Gray or Walter de Grey was an English prelate and statesman who was Archbishop of York from 1215 to 1255. He was Lord Chancellor under King John. Osmund, Count of Sées, was a Norman noble and clergyman. Following the Norman conquest of England, he served as Lord Chancellor and as the second bishop of Salisbury, or Old Sarum. 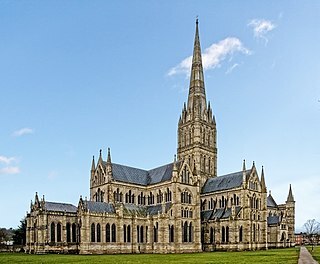 The Diocese of Salisbury is a Church of England diocese in the south of England, within the ecclesiastical Province of Canterbury. The diocese covers most of Dorset, and most of Wiltshire. The diocese is led by the Bishop of Salisbury and the diocesan synod. The bishop's seat is at Salisbury Cathedral. Tarrant Crawford is a small village and civil parish at the end of the Tarrant Valley in Dorset, England. The River Tarrant joins the larger River Stour here. The village consists of two small settlements: Crawford Farm and a few houses in the Stour Valley, and Tarrant Abbey Farm, a church, and a few houses in the Tarrant Valley about 0.5 miles (0.80 km) to the north. Locals regard the two settlements as separate villages. In 2013 the estimated population of the civil parish was 20. William de Wickwane was Archbishop of York, between the years 1279 and 1285. John le Romeyn, died 1296, was a medieval Archbishop of York. Nicholas Farnham was a medieval Bishop of Durham. Walter of Kirkham was a medieval Bishop of Durham. Robert of Holy Island was a medieval Bishop of Durham. Walter Branscombe was Bishop of Exeter from 1258 to 1280. Alexander de Stavenby was a medieval Bishop of Coventry and Lichfield. Roger Weseham was an English medieval Bishop of Coventry and Lichfield. Richard Blund was a medieval Bishop of Exeter. Peter Quinel was a medieval Bishop of Exeter. He became a cannon of Exeter Cathedral in 1276 and his episcopate began in 1280 and continued until he died in 1291. He issued a set of rules governing the clergy in his diocese and the required furnishing of churches and continued the rebuilding efforts at Exeter Cathedral. Old Sarum Cathedral was a Catholic and Norman cathedral at old Salisbury, now known as Old Sarum, between 1092 and 1220. Only its foundations remain, in the northwest quadrant of the circular outer bailey of the site, which is located near modern Salisbury, Wiltshire, in the United Kingdom. The cathedral was the seat of the bishops of Salisbury during the early Norman period and the original source of the Sarum Rite. The Church of St Mary the Virgin in Tarrant Crawford, Dorset, England, was built in the 12th century. It is recorded in the National Heritage List for England as a designated Grade I listed building, and is now a redundant church in the care of the Churches Conservation Trust. It was vested in the Trust on 1 July 1988. Harper-Bill, Christopher (1999). S. D. Church, ed. John and the Church of Rome. King John: New Interpretations. Woodbridge, UK: Boydell Press. ISBN 978-0-85115-947-8. Hoskin, Philippa (2004). "Poor, Richard (d. 1237)" ((subscription or UK public library membership required)). Oxford Dictionary of National Biography. Oxford University Press. doi:10.1093/ref:odnb/22525 . Retrieved 26 November 2007.